This downtown Vancouver hotel offers guests the best of both worlds: the activities and cultural events of the city, as well as a relaxing Vancouver resort experience. Guests can enjoy beautiful views of the coastline, distant mountains, and Stanley Park right from this hotel. Each of the 511 newly decorated guest rooms and suites is refreshingly appointed, with many rooms offering private balconies. 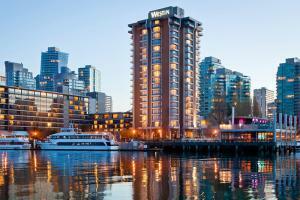 Located in downtown Vancouver on Coal Harbour, steps away from shopping, dining, entertainment, arts and culture. Currents at Bayshore Restaurant - delectable breakfast buffets and à la carte selections; Seawall Bar & Grill - fresh seafood selections and gluten-free cuisine. Roedde House Museum, Denman Street, The West Side, Vancouver Downtown, Wild Whales, Science World.